Facts to know about Camp! Proceedings got underway on Thursday evening with an information/registration session at the Grand Hotel, Denny Street, Tralee. Walkers came from all parts of Ireland with participants also from USA, Australia, Germany, Italy, Switzerland and UK giving the event a truly international flavour. 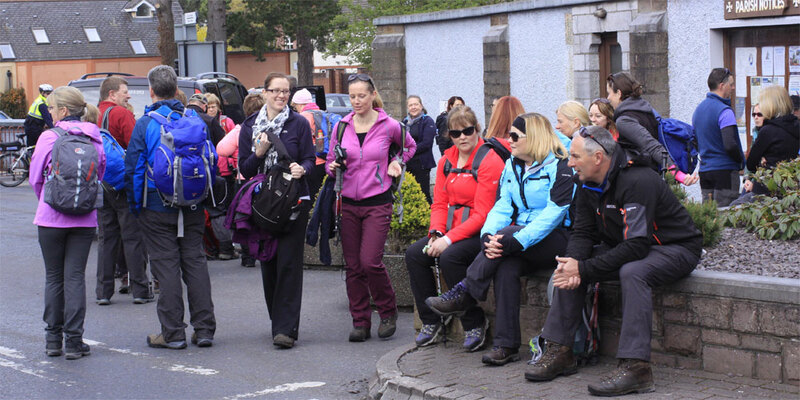 A group of 200 pilgrims with Kerry Camino walk guides gathered at 9 a.m. at St. John’s Church, Castle Street on Friday 4th May and following a blessing from Very Rev. Fr. Tadhg Fitzgerald, Parish Priest of St. Johns, the walkers set off on the first day’s walk “following in the footsteps of St. Brendan,” with the route taking them along the Canal Bank to Blennerville, Tonevane and across the scenic slopes of the Sliabh Mish Mountains (Curraheen/Derrymore, Killelton) to Camp Lower. Having experienced a beautiful day of sunshine on a challenging route, the tea and sandwiches prepared for the walkers by Mike and Anne O’Neill at the Railway Tavern were well received. Most participants availed of the buses provided by Kerry Camino to return to Tralee for the night, others had booked accommodation in the Camp area. Kerry Camino also provided luggage transfers for those requiring this service. Saturday morning began for most in Tralee with bus transport to Camp, numbers in excess of 200 boosted by local day walkers, setting off from the Railway Tavern in dry conditions at 9 a.m. for Annascaul, with a brief stop at Inch Beach on the way. A BBQ was enjoyed at Hanafin’s Bar on arrival in Annascaul. Again, some pilgrims chose to avail of local accommodation and others coming back to Tralee for the night. 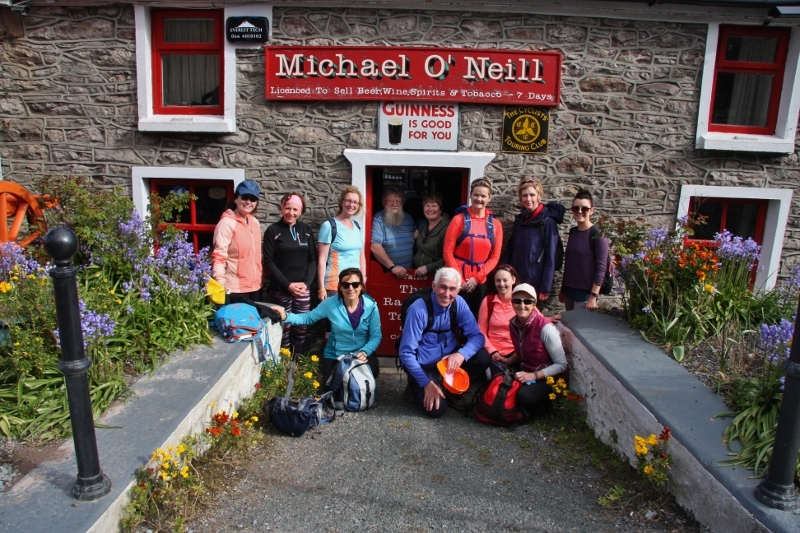 Sunday morning’s group travelled again on buses to Annascaul and 180 pilgrims set off from The South Pole Inn for Dingle. 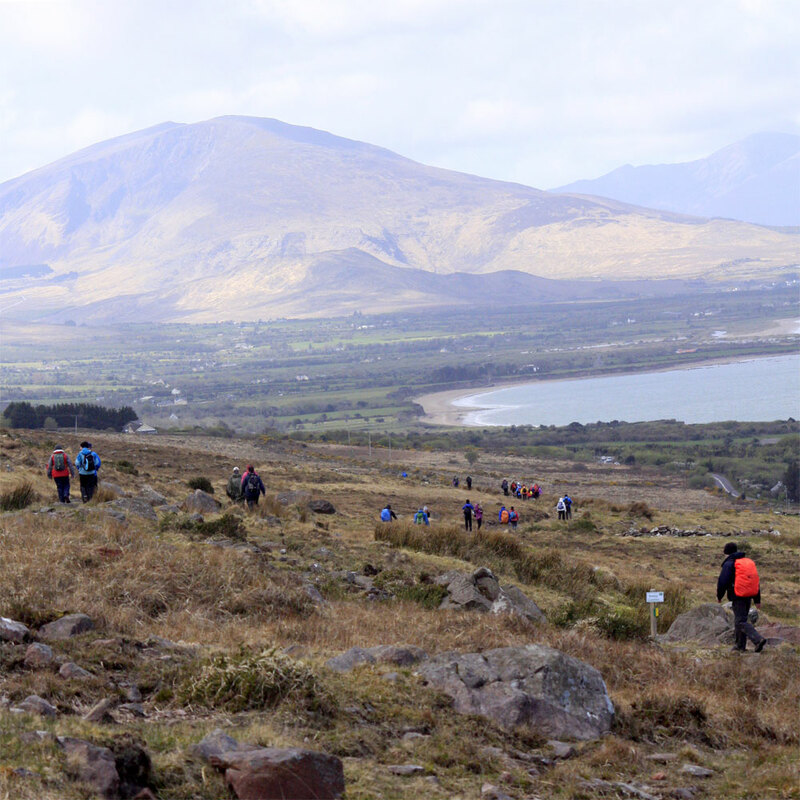 Weather conditions were ideal for this third and last stage of the Kerry Camino, with pilgrims taking in Minard, Lispole and traversing the mountain route to Conor Hill to the Church of St. James in Dingle. 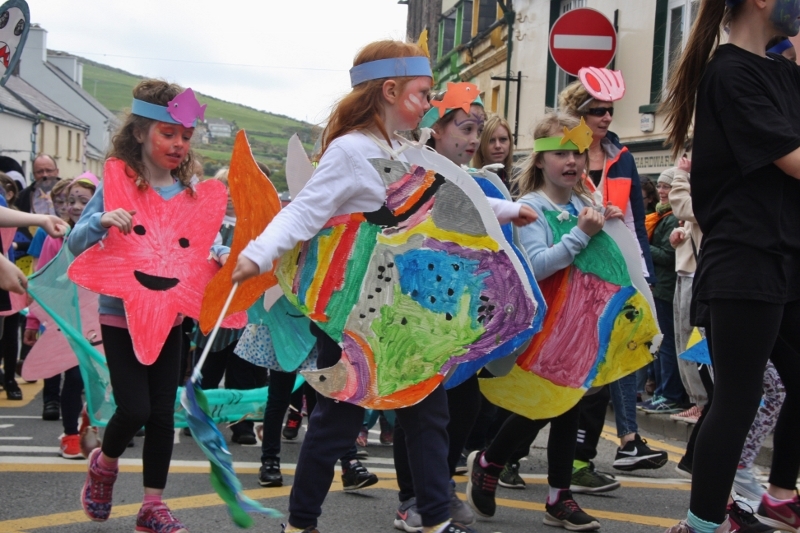 Feile na Bealtaine was in full swing in Dingle providing varied entertainment and a great parade for our walkers arriving into the town. Over the 3 days, pilgrim’s logbooks were stamped at stations along the route and Certificates were presented to all the walkers on arrival at the Church of St. James. Some participants stayed on in the Dingle area but most returned to Tralee, tired but with a sense of achievement and hopefully with happy memories and new friendships made on the Kerry Camino. 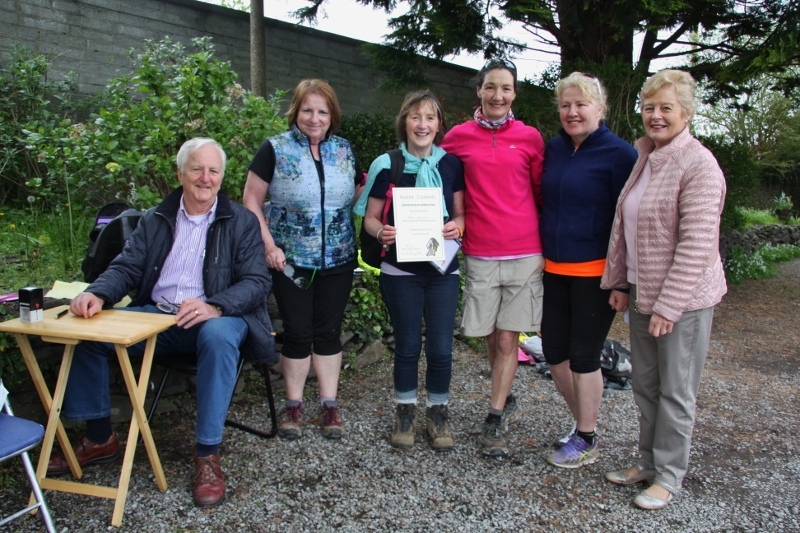 The weekend would not have been possible without the help of many willing volunteers, with particular thanks to members of Tralee Mountaineering Club and CaminoWays who acted as walk guides over the 3 days. Since Kerry Camino was launched in 2012, numbers participating have increased every year bringing new and welcome walking tourism business to the greater Tralee area. For anyone who would like to walk the Kerry Camino themselves, or a section of it at a time, passports are available at Tralee’s Tourist Office at the Ashe Memorial Hall. Kerry Camino Certificates can be collected on completion of the walk from Dingle Tourist Office. A 3 day guided walk of the Kerry Camino will begin on Friday 4th of May. There is an orientation meeting the night before. 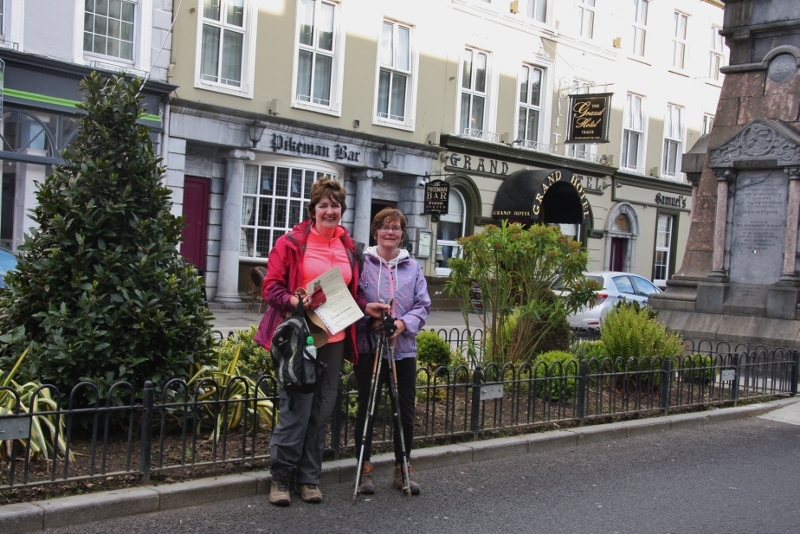 The first day’s walk is from Tralee to Camp. The second day takes us from Camp to Annascaul via inch beachand finally on the third day we walk from Annascaul to Dingle. Book tickets for this event online at this website. We have sold out the last number of years so booking early is advised. If you wish to stay overnight in Camp you should book your accommodation early as it fills up fast. We arrange transport back to Tralee each day of the walk. hiking boots or trail shoes. Rain gear, woolly hat, gloves. Water and food for the day. Boots are probably best for the first day as most of the walking takes place on a mountain side trail which can get very wet. The second day takes place on old roads with some rough trails and boreens. The third day of the walk is half minor roads and half rough trail. you boots should be well broken in before you set off on a long walk like this. I know it is well known but just to reiterate it, do not wear denim jeans on the walk, they tend to chafe which sounds uncomfortable but in fact is hellishly painful especially the second day. Breathable fabric tee shirts can be purchased online cheaply or in supermarkets. Avoid cotton. Walkers can register for this years walk in the Grand hotel on Denny Street at 7.00. We will have your passport and have a talk about the walk tomorrow. You can also book your place for our Bar-b-q on saturday night in Annascaul if you have not already done so (€10). The Grand hotel is located here. Parking is restricted on Denny Street due to road works parking is available in the following Locations. Click on the icons for more details. Group of walkers waiting to start the 2016 Guided walk in St. John’s parish Church in Castle Street Tralee. The Kerry Camino Walking Weekend is a perfect introduction to multi day hiking with experienced guides on the trail with you. We have support vehicles and luggage transfer if required. The 3 day hike from Tralee to Dingle is tough in parts but doable for the reasonably fit. We recommend doing walks of between four and seven hours for training the weeks before the hike and that your boots be well broken in. you will walk on a variety of surfaces from paved roads to mountain sides where the the trail is marked by posts in the landscape. The walk is designed to give walkers unique views of Tralee bay, Brandon Bay and Dingle bay as they walk through a landscape whose history goes back thousands of years. Guess who’s on a list of the best hikes in Europe? If I want to walk the Kerry Camino guided walk on the May bank holiday how do I go about it? Itinerary for May bank holiday weekend Walk on the Kerry Camino. A walk of penitence, Contemplation, or just a walk for fun in good company. Cost 40 Euro for the 3 days 15 Euro for each day for one or two days. Registration and information night, passport pickup : Grand hotel 7.30 PM to 9.00PM Friday evening. Registration and Passport Pickup at Start (Saint John’s Catholic Church) on Saturday morning 9.00AM to 9.30 when walk will start. If you experience problems there are places you can come off the walk and be taken to the finish point where you can join the others. You will then be ready for the next day. There are several places along the route to Camp where there walker can stop and sit for a refreshment break and take in the view. We will all meet up at Camp to relax and enjoy each other’s company. Day two will start at Mick O’Neill’s Railway bar car park. Day two walkers can register and passport pickup. Those looking for lift from Tralee , cars will be leaving from the Brandon Hotel Car park at 9.00AM Day two walkers can register and passport pickup. There is a steady climb after crossing the Finglas please look back and see the sights of Tralee Bay behind. Again there are several seats at which you can rest and refresh. Again set your own pace if you experience any problems help is at hand to take you to finish. Again remember you are never alone. A stop at the wonderful Sammy’s beach bar, where one can have lunch, snack or a drink. Set off at your own pace again to finish in Annascaul you won’t be left alone, you will be told when the last one is leaving. Lifts back to your car or back to Tralee will be organised After a post walk get together. Will start at South Pole Inn. Day three walkers can register and passport pickup. Those looking for a lift from Tralee , cars will be leaving from the Brandon Hotel Car park at 9.00AM. The finish is at Saint James’ Church Of Ireland Church in Dingle. Where certificates of completion will be given to all participants. Again you won’t be on your own and pickup will be arranged for those in trouble bringing you to the finish for post walk get together. Bus will be leaving Dingle later with a 5euro charge to Tralee or routes along the way. Enjoy your walk with us. Leave nothing only your footprints and carry nothing with you only your memories. We were delighted to host the wonderful people from Camino Ways when they launched their new website Irelandways.com. Our relationship with the Irelandways.com team began rather serendipitously, one of our committee, Ingrid, had been sharing their pictures on our facebook page and they noticed and a series of contacts began. Ingrid happened to be in Dublin when they rang her so she called into them in their offices just as they were planning to launch their new website. They brought press from around the world and we showed them what the Kerry Camino had to offer. Day 1: Short guided walk of Tralee with visiting journalists and launch of website at Tralee Bay Wetland Centre. 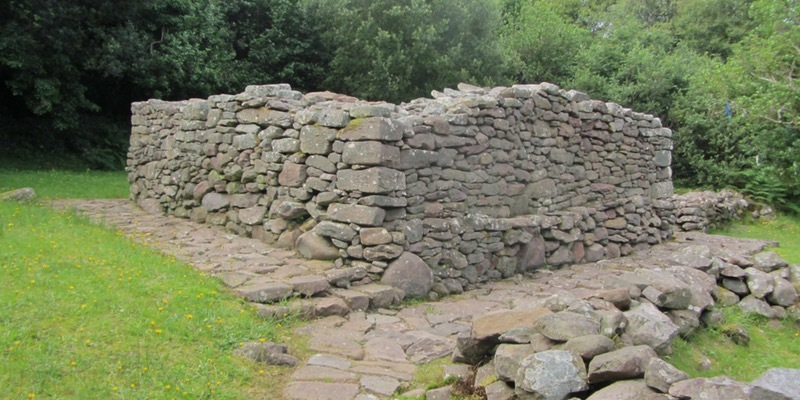 Day 2: Walk along the kerry camino from Camp to Inch with the Ireland ways team.